I’m working on a small walnut slab I picked up that has some cracks/knots I need to fill and I’m looking for epoxy recommendations. Google is great…other than the million results that are a pain to go through. What brands do people use here and where’s a good place to buy them? I have a TAP plastics local that sells 2 part epoxy in different sizes but it’s very expensive there. The 2 part tubes I have are fine for small fixes but the stuff is fairly thick and I need it to fill the cracks completely. I have the western systems for doing big stuff, but for medium size, i tend to use the small tubes, with plungers, i believe its made by locktite and is a supposedly a 5 minute product, depends on temperature, for sure. Both available at Jamestown distributors. I love Jamestown as you can call them and they will give you great customer service as to what variation of those products are best suited to your needs. System Three is very thin and will flow into even the smallest cracks. In fact, I’ve found it’s best to do two passes. The first is a small pour and once it gels, a second pour will fill the cracks to the top. If I try to pour it all at once, it can make the tape on the bottom sag due to the weight above. There are three different hardeners for different set times. I also use their black pigment paste. Just a dab is all it takes. I’ve used System 3 two part for filling walnut voids. I usually add a couple drops of dye for color. I’ve also used the 5 Minute, but now only consider it for small repairs due to the short working time. System 3 is available at Woodcraft if you have one close to you. This is the method I use and believe it is what Rich is referring to if the crack goes all the way through. First pour is light and thin or it will heat, bubble, and melt the tape. Rather than trying to dye the epoxy, I like to thicken with sanding dust from the same wood as the project. Doesn’t need a lot. Any reasonable epoxy will fill a hole well, even thickened with sanding dust. The stuff is a runny as honey, typically. Epoxy thickened this way will take clear finish well, though it will tend to be darken more than the solid wood. I use a product called “Z Poxy” It is actually a finishing resin and is quite thin and penetrates well. So well that just a crack in a knot, in cedar, requires tape on the reverse side to stop it from running out. I’ve been using Total Boat brand epoxy and hardener and love it. I’ve never used West Systems to compare it to, but having the metered pumps to dispense it is the most convenient way I’ve ever used epoxy. I use the 2:1 setup and have different hardeners to go with the resin. It’s a little cheaper than the West Systems. Ohh and I’ve never tried mixing sawdust in it, but that sounds like a good idea. I use Transtint dyes and it takes a couple different ones to get the right color, so factor the cost of those in @$20/ea if you go that route. You use so little of them at a time that they’ll last you forever. I use a lot of rough wood in some of my turning. To fill cracks and holes always use Bob Smith 15 minute cure (this is working time) 2part Epoxy. I usually order from ebay or amazon. 4.5 oz. plastic bottles. I mix all kinds of metal shaving dust, glitter, and sawdust into it to hide or accent. Price is reasonable and it goes a long way. If it is for a small crack you should have it warm when you apply. Any neat epoxy will flow sufficiently to fill voids and cracks (hint: most of the syringe type stuff at the BORG is not neat epoxy – it has fillers to thicken them up) and will flow even better when warmed up (both the epoxy and the wood). It will flow to places you may not want, so make sure to fully tape or otherwise contain it. Agitating with a toothpick or similar will get rid of any air bubbles that may be trapped in deeper crevices. And you can use darn near anything to color it… used coffee grounds, colored chalk, sawdust, the power stuff used to color cement, paint, tints and dyes, crushed rocks, metal filings, etc.. use your imagination! I bought my 2 part epoxy from US composites. It was about 1/3 the price of west systems and I had very good results on several projects. Cure time for the epoxy was approx 4 hours to the touch and 16 hours before I could scrape it flush. It was thin enough to flow into tiny cracks I needed to fill and it worked great. 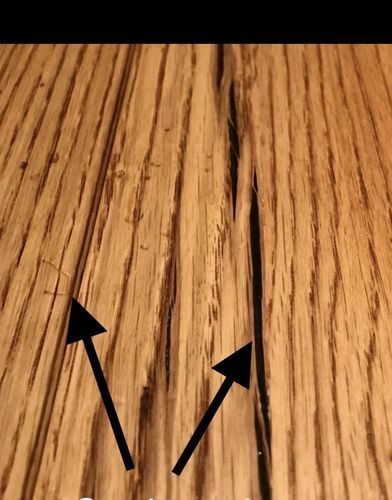 I refinished my kitchen table approx 8 months ago, filling several cracks with it and have had no issues with it at all. Gilley: Let me emphasize sanding dust, not sawdust. Doesn’t need a lot, either. we’ve been using MAS epoxy on a kayak, and it is very thin and very clear. the 5-minute stuff i have is not clear, so you may want to run a test on something first. cracks need to be backed up with tape. if you get bubbles, one of the manufacturers says to run a propane torch over the epoxy very quickly. i used a heat gun on a patch about 1/4” deep and it worked like a charm. it takes a second or so and the bubbles disappear. the kit that came with the kayak parts has a silica-substiture material to thicken the epoxy a little bit, then they use wood dust to make peanut butter consistency. both get very hard. good luck. Differences between consumer epoxy adhesives (or epoxy surface coatings) in relatively small. They all use similar chemistry. As long as you use an adhesive system when need strength, and a coating system type when you need glossy appearance; can just pick what ever is readily available at your location and it will work just fine. Truth is that most of the local brand no-name 5/15/30/60 min cure (2oz—8 oz bottle) blister packs sold in hobby/wood/borg stores are made by same 2 suppliers using same chemicals with only name/packaging being different. Same holds true for composites industry epoxy systems like System 3, West Systems, etc; all use similar resins, curative, and reactive diluents to create “epoxy”. -fast cure = high cure stress and poorer physical properties. Do not recommend using less than 1hr cure system for anything you want last a long time. Best strength will come from slowest cure with small bottles/tubes sold in stores, and med-slow cure with common systems found in wood shops (west/system3). This also means picking a cure time based on your workshop temperature. -lowest viscosity systems (water thin) are typically intended for laminating composite fabrics (boats/cars/planes/etc), and usually designed to be “softer” and more flexible after cure. This can be helpful with wood joints, but not helpful if you have a large gap to fill with something strong. Use of medium viscosity curative with a laminating resin works best for filling wood cracks/knots. - cure speed is not only factor to consider when are able choose different hardeners with epoxy products. : Need to consider ambient temp, and humidity. Some curatives can/will absorb local humidity, and “blush”. This creates a soft white surface residue that inhibits anything sticky on top of it without sanding it off. Some have minimum cure temperatures. : Need to consider color. All systems will tend to have a yellow tint. Some more than others. Like varnish, the yellow will darken slightly over time. [Most “clear” table top epoxy coatings use transparent blue dye to counteract the yellowing effect]. If you do not want your cracked walnut filled with yellow, then is best to use a pigment to color your epoxy. Black is easy using laser toner cartridge powder. Can also use very small amounts of Transtint powders, or artist oil paints (artist oil has compatible chemistry). If you want transparent color shift can even use a drop of food coloring (yes – gycol/water based stuff borrowed from wife’s baking supplies). Too much food coloring will weaken epoxy, but 1-2 drops per ounce has minimal impact [red+green=brown]. Finding epoxy in quarts/gallons locally can be challenging. But since you are less than 1 hour from Pacific ocean, you should have a plethora of marine suppliers nearby? West Marine is nationally found and carries West Systems, we even have one here in Phoenix despite being surrounded by sand and cactus. Another easy source for epoxy is aerospace composite suppliers. They sell epoxy resin/curatives in 5 gallon pails! There are many online sources; Aircraft Spruce, USComposites, fiberglasssupply, etc. Epoxy gets much cheaper when buying in bulk (if you need it). So pick a brand you can afford, hopefully supplied locally, and have some fun with chemistry!